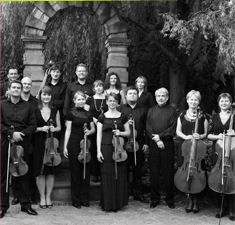 The Wratislavia Chamber Orchestra Wroclaw (Poland) was founded in 1996 by the outstanding virtuoso violinist Jan Stanienda who is the orchestra’s concertmaster as well as its conductor and artistic director. Its members are carefully chosen; the ensemble consists of select musicians, winners of international competitions, professors at music academies, and virtuoso soloists. The orchestra is bound by a common passion for chamber music – in the opinion of many eminent musicians, the best medium for interpretation of music. The musicians of Wratislavia have performed with soloists like Grzegorz Nowak, Krystian Zimerman, James Galway, Pawel Przytocki and Sharon Kam, among others. They formed the core of the string section of Sinfonia Helvetica, which performed in Italy and in Switzerland with Krystian Zimerman, and of the Menuhin Festival Orchestra, which had concert tours of Japan (Suntory Hall, Tokyo, Salamanca Hall, Gifu, and Symphony Hall, Osaka) and Germany (Beethovenhalle, Bonn and Philharmonie Gasteig, Munich). Wratislavia started its artistic journey with a performance during the festival Warsaw Musical Meetings, Old Music – Modern Music in May 1996. In Poland they performed in Warsaw (National Philharmonic, Royal Castle), Radom, Przemysl, Poznan (Festival of Music and Drama), Lancut (Musical Festival), and Wroclaw (32nd International Festival Wratislavia Cantans, the inauguration of the 46th Eucharistic Congress, and the Festivals WRO’2000 and Musica Polonica Nova). They have also given numerous performances abroad, in Germany (Berlin, Munich) and also during the Olympic Games in Atlanta, USA, among others. Wratislavia plays music ranging from baroque to contemporary, and uses the classic framework of a Mozartian orchestra, increasing the ensemble as the repertoire requires. Wratislavia has given numerous premieres of works by contemporary Polish composers, has taken part in many radio and television recordings, and has recorded many CDs. Especially worth mentioning is Wratislavia’s participation in the recording featuring Katarzyna Duda, one of the most impressive Polish violinists of the young generation, as soloist. This CD, titled Le Streghe 2, contains virtuosic violin works and was nominated for the FRYDERYK Phonographic Academy Award in 2001. A year later Wratislavia’s next CD, Polish Music, also received a nomination for the FRYDERYK prize. Wratislavia is the originator and host of the Wroclaw Chamber Music Festival Arsenal Nights (Wieczory w Arsenale), which takes place annually since 1997. Wratislavia also started the movement to raise funds for the rebuilding of the famous Saxon Opera House SEMPEROPER in Dresden, after it was damaged by a flood in the summer of 2002.